As the special counsel’s investigation is expected to soon come to a conclusion, President Donald Trump says the decision to make Robert Mueller’s report public is “totally” in the hands of the attorney general. When asked if he would have a problem with the report being made public, the president wouldn’t answer directly. “That's up to the attorney general. I don't know. It depends. I have no idea what it's going to say,” said Trump. The president sat down for a Super Bowl Sunday interview with CBS News’ Margaret Brennan on “Face the Nation,” and was asked about the special counsel’s probe, the likelihood of another government shutdown over border security funding, his decision to -- and backlash against -- pulling troops from Syria, his public clash with intelligence chiefs, his upcoming meeting with North Korea’s Kim Jong Un, and the political unrest in Venezuela. The president said that he has not given any thought to whether or not he should pardon Roger Stone, a longtime friend and advisor, who was recently indicted by a grand jury on charges of lying to Congress, obstruction, and witness tampering. Stone is accused of making false statements to the House and Senate Intelligence Committees about communications with Wikileaks during the 2016 campaign. The president has sought to distance himself and his campaign from any connection with Stone. Trump sat down with Brennan on Friday afternoon at the White House ahead a trip to his private Mar-a-Lago estate in Palm Beach, Florida. “I don’t take anything off the table,” Trump said when asked about the potential for another shutdown. He again suggested that a national emergency could be declared instead in order to fund a border wall. 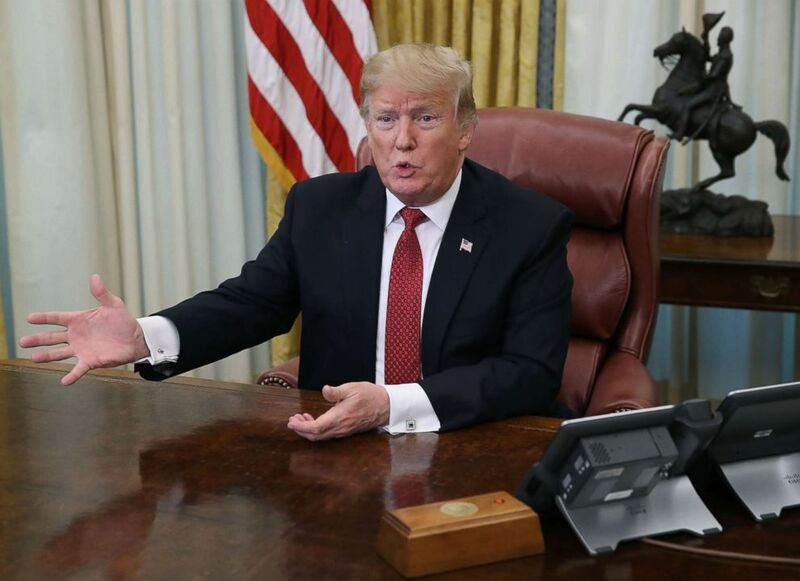 “It's national emergency, it's other things, and you know there have been plenty national emergencies called,” Trump said. Republicans on Capitol Hill have urged the president not to declare a national emergency saying it could set a bad precedent. Some Republicans have also been at odds with the president over his recent foreign policy decisions, like his decision to pull troops out of Syria. The president said he was elected, in part, because he campaigned on bringing troops home. President Donald Trump speaks during a meeting in the Oval Office at the White House, Jan. 31, 2019. The president also tried again to change the narrative surrounding General Jim Mattis’ decision to resign as Secretary of Defense. Mattis submitted his letter of resignation after the president decided to pull out of Syria. But the president said he told Mattis to resign. “He resigned because I asked him to resign. He resigned because I was very nice to him. But I gave him big budgets and he didn't do well in Afghanistan. I was not happy with the job he was doing in Afghanistan,” Trump said. Trump also commented on the divide between his administration and the intelligence chiefs he appointed. The president initially attacked CIA Director Gina Haspel and Director of National Intelligence Dan Coats after their congressional testimony contradicted several of Trump’s claims about Iran, North Korea and ISIS. Tweeting on Wednesday that the intelligence community's report on Iran "extremely passive and naive," the president suggested, "Perhaps Intelligence should go back to school!" But in his interview with CBS, the president brushed off concerns about the report itself. “Let me just say it wasn't so much a report. It was the questions and answers as the report was submitted and they were asked questions and answers,” Trump said before touting his success with Syria and his efforts to defeat ISIS. Trump, who summoned Haspel and Coates to the White House to express concerns over their testimony, then blamed the media for creating a “distorted” and “false narrative.” In his interview with Brennan, the president seemed to step away from his critical comments, and encourage his officials to form their own opinions even if they contradicts his own. “And you know what I tell people -- you can testify any way you want. I'm not going to stop them from testifying. They said they were mischaracterized -- maybe they were maybe they weren't, I don't really know. But I can tell you this, I want them to have their own opinion and I want them to give me their opinion. But, when I look at Iran, I look at Iran as a nation that has caused tremendous problems,” he told Brennan. On another foreign policy front, as the Trump administration continues to challenge Nicolas Maduro's claim to the presidency in Venezuela. Trump said he rejected Maduro’s request for a meeting a few months. Trump has continued to show his support for Venezuelan opposition leader Juan Guaido as the interim president of Venezuela, and said a U.S. military action in Venezuela could be a possibility. “Well I don't want to say that. But certainly it's something that's on the -- it's an option,” Trump said. Plans are also underway for a second summit between Trump and North Korean leader Kim Jong Un as pressure builds for the country to give up its nuclear weapons. Teasing the meeting, Trump said his administration will likely release the location of the meeting either at the State of the Union or shortly before. Trump expressed doubt that the country will give up their nuclear weapons, stating there is a “good possibility” that Kim won’t take that step. Still, he has hope that the two leaders will strike a deal. “I think he's also tired of going through what he's going through. He has a chance to have North Korea be a tremendous economic behemoth. It has a chance to be one of the great economic countries in the world. He can't do that with nuclear weapons and he can't do that on the path they're on now,” Trump said.